Snakky is the first snack vending machine by Necta that is only 1700mm tall (increased to 1830mm via an optional lift up kit), which is a solution conceived for small to medium locations. With innovative features such as the ergonomic delivery bin (patented) with anti theft device and slow closing movement and vend detection system, the Snakky offers excellent value for money. The new single block slide-in/out cooling unit requires less maintenance, due to the new wire type condenser. The payment system and electronic board are located inside a separate slide-out compartment, which means that the product temperature is maintained when operators and technicians work in this area. The Snakky has been designed to coordinate with the Kikko drinks machine, however, will sit alone or coordinate with other 1830mm high machines – offering a complete vending solution. Has VarioTemp feature to do snack & cold food or drinks at the same time. Refrigeration can be turned off if not needed – no longer will you have a cold food machine that only does food! Can / bottle module available or vend them through the coils. Stainless steel shelving & coils! High security 5 pt lock system and high security keypad. Unbreakable Lexan front protects double insulated glass inside. Smart Waiter shelf delivery available! “Light Gate” infrared product guaranteed delivery system. 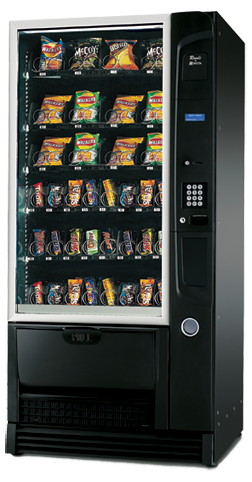 Rondo snack vending machines from UKV maintain the highest standard in both reliability and design.The Rondo is a heavy duty vending machine perfect for supplying a large choice of products to cater to any market.To ensure the satisfaction of customers, the Rondo vending machine has a delivery bin sensor that detects whether a product has been vended successfully. The patented ergonomic delivery area opens outward ensuring that products are always easy to collect. The Royal Vision Vendor has a smaller footprint than most similar can and bottle drink machines, yet it still offers up to 40 different selections and prices. It will vend from the small 250ml. energy drink cans up to 20oz. bottles. The RVV 500 entails a new type of delivery process. Most glass front systems allow the purchased product to free fall down into the delivery bin. The RVV 500 has a unique retrieval system consisting of an elevator which retrieves the sold product from its shelf and delivers it safely to the delivery bin, eliminating potential product damage or product foaming. 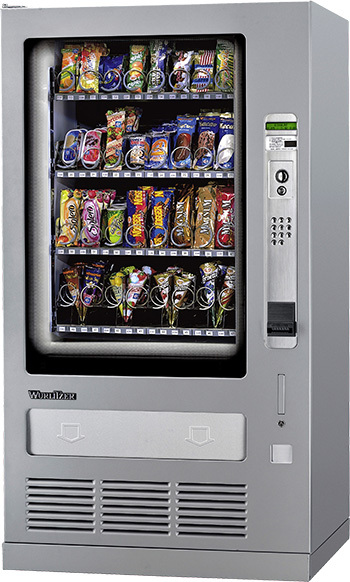 The Sfera P is the ideal solution for snack and food vending in public sites where vandalism and theft mean that security is a top-priority issue. 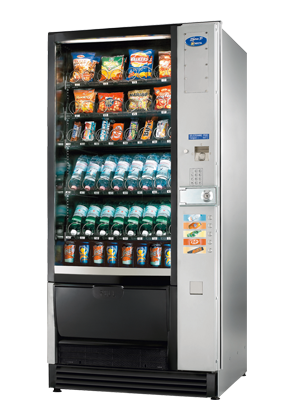 Offering many of the features available with the standard Sfera, including the large illuminated door, maximum product visibility and reinforced double-glazing, the Sfera P is designed to give a high-quality vending solutions every time. 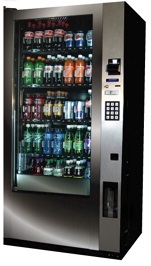 It can be banked together with the Astro P machine to provide a vandal proof food and drinks vending solution.